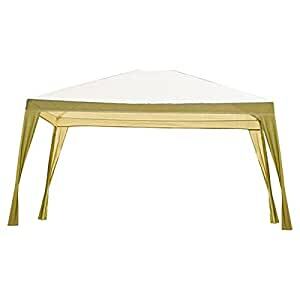 This 12Ft x 10Ft Folding Gazebo with carrying Bag in Camel combines knitted fabric with a sturdy aluminum frame to create a lightweight gazebo that is easy to set up and take down. The knitted fabric is made using UV stabilized high-density polyethylene materials. Special lock knit construction blocks up to 90% of harmful UV sun rays while generating cooling breezes underneath the shade canopy. The aluminum frame is powder coated to complement the shade canopy. Perfect for picnics, outdoor parties or any other occasion.